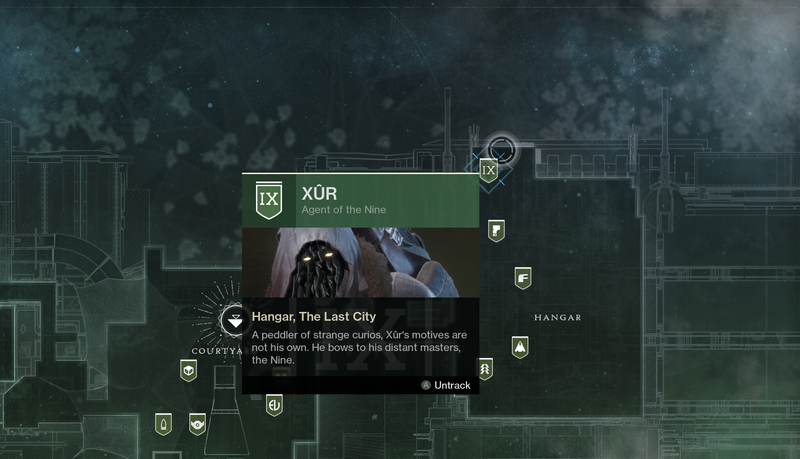 This weekend you can find Xûr hanging out at the Hangar in the Tower. View more Xûr’s inventory, news, and more below. Reminders: Season of the Drifter is live and Reckoning Tier 2 is available now (Recommended Power 670)! Read the Destiny 2 Update 2.2.0 to find out about what’s new and what has changed. Destiny 2. FORSAKEN EXOTICS! Xur Location & Exotic Loot March 8, 2019. Where is Xur 3-8-2019? by Mesa Sean on YouTube << Click link for more Destiny 2 videos! SEASON OF THE DRIFTER – LIVE NOW! View more info about Season of the Drifter by clicking here! From the Bungie blog post: Tier 3 is considered endgame content, requiring Power level 680 to enter and meant to offer a worthy challenge to all you powerful Guardians as you gear up to max Power this season. The activity is set to 690 so bring your best gear. We recommend forming up a fireteam for coordination, but matchmaking is still available to you. Mar 07: Destiny 2: This Week at Bungie – Ding. 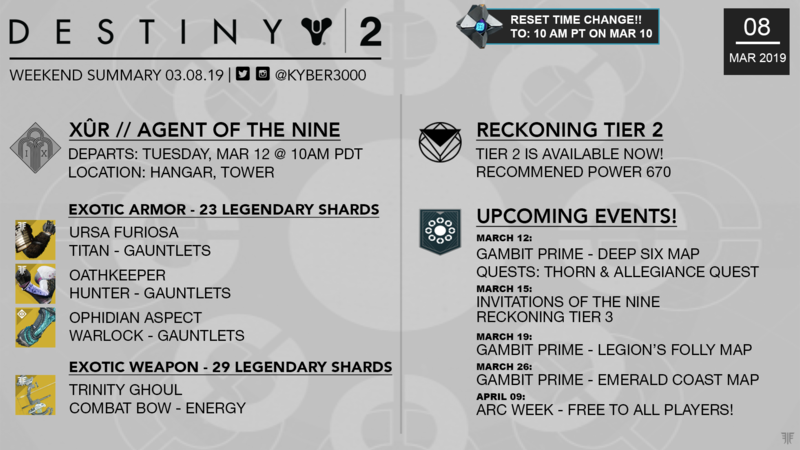 Feb 28: Destiny 2: This Week at Bungie – Primed and Ready! Feb 28: Season of the Drifter – New Season. New Challenges. New Rewards. Three streams have been lined up for you. Bungie will be doing three Gambit Prime Bungie Bounties over the next three weeks featuring all three platforms, starting with Xbox. The rules are the same. Seek out Bungie during the two hours the bounty is live, and defeat them in Gambit Prime. Do that, and everyone on your team will receive the Sign of Mutual Combat emblem from Bungie. Thanks for stopping by and supporting this blog. I hope you all have a great weekend! Follow on Twitter and Instagram the most up-to-date posts!